Remember the Fort Lauderdale of spring break madness—-with paradise lost to swarms of college students hoarding the town? Well hallelujah, today the spring-break kids go elsewhere, leaving Fort Lauderdale’s delights to locals and tourists wanting a comfortable, non-crowded, spring, winter, or anytime warm-weather break. From trendy places on Las Olas Boulevard to little-known, water-side favorites, the restaurant scene rocks! Originally built in 1920 by artist Frederic Clay Bartlett and his second wife, composer/poet Helen Birch—and later embellished by Bartlett’s third wife, Evelyn Lilly—the 35-acre Bonnet Estate is now on the U.S. National Register of Historic Places and open to the public. 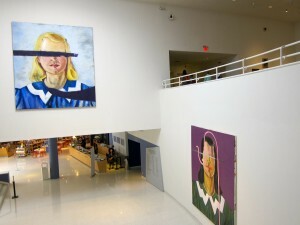 Guided tours take visitors to see Bartlett’s studio and home, both filled with art and whimsy. The Bonnet House captivates those interested in history, South Florida’s flora and fauna, and the lifestyle of early Fort Lauderdale’s rich and elite. In 1928, when prohibition prevailed, “Cap” Knight, a well-known rumrunner, opened a restaurant/speakeasy on an island accessible only by boat. Ever popular, Cap’s Place served celebrities, presidents, gangsters and most of the famous and infamous who landed in South Florida. (Guests included such diverse personalities as Al Capone, Winston Churchill, Walt Disney, Barbara Stanwyck, Joe DiMaggio, Mariah Carey and John F. Kennedy.) Now on the National Register of Historic places, Cap’s Place still serves good food garnished with history to guests who still must take a water shuttle to the restaurant. Specialities include local seafood, hearts of palm salad, and, of course, a rum runner cocktail. Combine 3/4 ounce each: Bacardi rum, Myers’s dark rum, blackberry brandy, crème de banane, Rose’s lime juice and Rose’s grenadine. Add 4 ounces Franco’s Lemon Mix (or sweet lemonade). 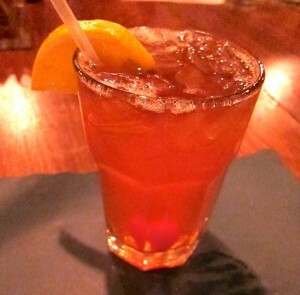 Serve on the rocks garnished with a slice lemon and maraschino cherry. Fort Lauderdale is both a casual beach/boat community and a cosmopolitan city containing a variety of impor cultural institutions. 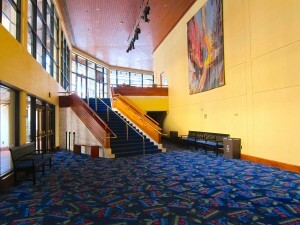 and the Broward Center for the Performing Arts with rotating shows and restaurants. 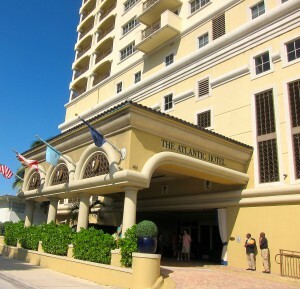 Our choice: The Atlantic Hotel & Spa, a beach-facing, AAA Four Diamond property. The hotel’s spacious suites include a large bedroom, big bathroom, and substantial living room holding a mini kitchen and balcony overlooking either the beach or town. Gracious lobby, lovely pool, tranquil spa, and friendly staff help guests feel pampered. For an unbeatable breakfast, sit overlooking the sea, on the terrace of the hotel’s Beauty and the Feast restaurant and order the signature Lobster Omelet. Sigh! A perfect way to start a sunshine day. Crack eggs into mixing bowl and whisk vigorously until well blended and fluffy. Melt butter in an 8-inch non-stick pan over medium heat. Add lobster meat and sauté until meat is warm, about 1 minute. Again, beat eggs vigorously. Add eggs to pan with lobster. Using a rubber spatula, push eggs from bottom of pan to top until eggs are barely cooked through. Crumble the Boursin into the omelet and allow to heat for 30 seconds. 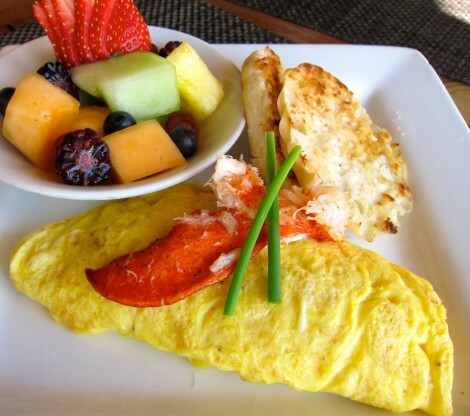 Fold the omelet onto a plate. Garnish with chives and lobster meat. Serve immediately.